A spectrum of seasonal hues. When leaves are turning and the vivid colors of summer are melting into the warm, mellow hues of autumn, this Mokara mix of pink, orange and yellow is the perfect accompaniment. Or choose a triad of colors to suit any occasion or mood. 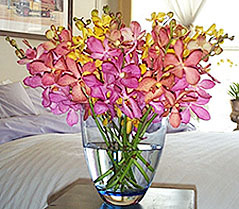 For other Mokara varieties, please view our Vanda-Mokara collection. 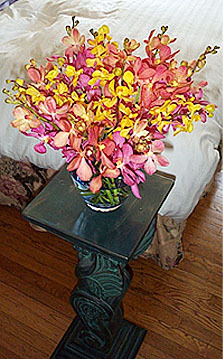 The arrangement above was created with 15 perfect stems of freshly cut Vanda Mokara in Isabellas's Studio glass vase. Each purchase includes care instructions and an exquisite gift card for your personal message. Each stem is approximately 12-15 inches tall bearing 8-12 blooms and comes with individual water vials. The flowers measure approximately 2.5-3 inches in diameter.